At first glance, much of this square-edged pot may seem very similar to a basic pot deign. 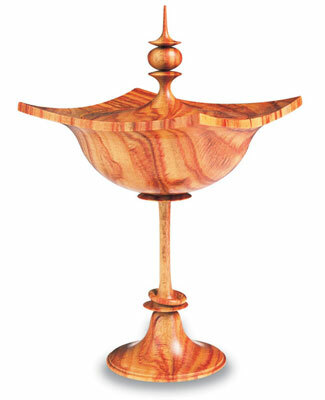 They each have a stemmed pedestal, a finial at the top, and a lid that is recessed into the base, so you could be forgiven if you assume that the turning methods are the same. However, having a square rather than a circular flange around the bowl changes not only the appearance, but also some of the ways in which the pot is made. A square lip will restrict your access to the finial when turning and, as the surface of the square flange is turned before the lid is parted off, the finial prevents the tool rest sitting close to the area being worked. For this project I would advise you to err very much on the side of simplicity until you gain experience. A flange width of at least 1/4in (6mm) around the square edge, and very basic decoration upon a stem of 1/2in (13mm) or more is not unreasonable for your early attempts. Start with a blank about 6in (152mm) long and from 2 1/2in-3in (64-76mm) square. Within reason, the design can be made from any size blank, but if you work with anything less than 2in (51mm) square, the pot loses some of its visual impact as the square lines around the top will be less significant. I would like to stress that with any square-cornered project rotating at speed there is always the danger of injuring yourself. If you are in any doubt as to your ability to tackle this project, I suggest you come back to it once you have progressed a little. 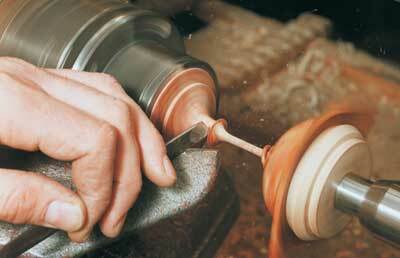 A good introduction to working irregular edges is to practise on a few simple, shallow, natural-edged bowls. Find the exact centres of the work prior to mounting in the lathe, as any errors will result in the square edge of the pot being lopsided. My preferred method is to use a marking gauge and run it along all four edges. This will leave a small box in the middle, from which the centre can be easily found. Alternatively, you could mark across the diagonals. Mark a line defining where you want the join between the lid and the base of the pot and then, with the blank secured between centres, rough turn the profile. Take care if you are using a standard 3/4in (19mm) roughing gouge as you may splinter the edges of the wood, which would ruin the edges of the square later on. Alternatively, you could use a 1/2in (13mm) spindle gouge to rough out the form around the area of the square edge. Start by turning away some of the lid area to remove a 45 degree section of wood, working close, but not right up to the line in case the wood splinters. Keeping to the left of the line by about 1/2in (13mm), rough out the base and stem of the pot, turning down to around 1 1/2in (38mm) in diameter - any thinner and you will not have the rigidity to support the pot for hollowing later. Don't forget to leave enough at the base to create the dovetailed fixing. Reduce the profile further using a 1/2in (13mm) spindle gouge to remove some of the excess waste from the top of the lid and the underside of the bowl. Turn a dovetail mounting at the base of the pot and rough out the shoulder for the lid with a 3/8in (10mm) beading and parting tool. Put the pot aside to finish seasoning and stabilize. After the wood has stabilized, remount the work in the chuck jaws. With the tool rest positioned across the top of the pot at about 30 degrees to the lid of the pot, true up the top face of the square flange. In an ideal world you would start the cut at the centre of the work and draw the cut out to the edge, working with the grain. However, as access is restricted by the lid, which is still attached, I suggest that you work from the outside inwards, cutting against the grain. Taking only fine cuts so as not to splinter the wood at the edges of the square, turn a slightly concave surface using the tip of a 3/8in (10mm) spindle gouge. This will give a gentle curve on the square edge when the pot is finished. You will be working very close to the spinning corners at this stage, so take extreme care as to the whereabouts of your fingers. If you have not had much experience of working with square flanges, I strongly suggest that you practise some of the cuts first. Whenever you need to reduce square stock to a cylinder, use the waste to practise and turn a series of shoulders all the way along its length. If you do this a few times you will gain valuable experience. Once the top face of the square has been formed, turn a parallel shoulder that will become the fitting for the lid. The diameter of this shoulder should be at least 5/16in (8mm) inside the square edge (no more than 2 3/8in (60mm) in diameter when using 3in (76mm) square stock). This will allow sufficient wood in the base of the pot to recess the lid into later. You will need the 3/8in (10mm) spindle gouge to turn in the shoulder as it needs to continue until it is within 1/32in (1mm) of the top face of the base. The concave surface around the square would make it more difficult to use the parting tool. As the cut nears the square face, angle the gouge over so that just the tip is cutting. If you don't do this, the lower wing of the tool could catch against the square edge. Take care to ensure that your fingers do not venture too close to spinning corners. If you are worried that you will catch the tool, use an angled scraper or a 15 degree dovetail form tool, such as a hollowing 'Mole', to cut the shoulder. With this you will be able to reach into the corner with less risk of catching the edge. At this stage the shoulder should be at least 5/16in (8mm) proud of the top corners of the square. Mark on the position of the underside of the lid, using the 3/32in (2mm) fluted parting tool. To do this, slowly bring the side of the parting tool close to, but not touching, the top corners of the base, and cut into the shoulder to a depth of about 5/8in (16mm) to mark the position of the lid. Because the pot has square corners, I suggest that to begin with you leave a gap of at least 1/8in (3mm) between the parting cut and the square edges. Avoid using a parting tool with a cutting tip higher than the centre of the tool, as there is a high risk of it twisting into the wood and shattering the corners of the pot. 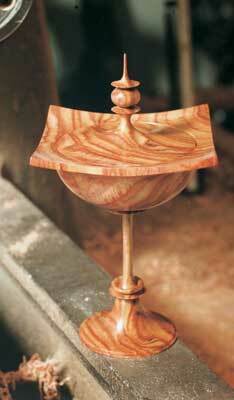 Turn the face of the lid using the spindle gouge on its side to cut the wood in a shearing action. 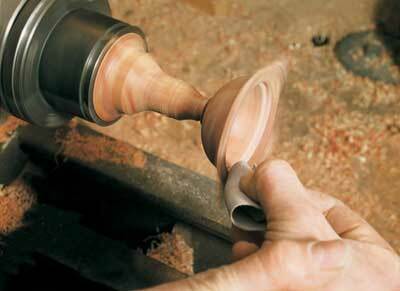 Turn a slightly curved surface leading out towards the finial. Continue the cuts until you are left with a parallel shoulder between the parting cut and the face of the lid approximately 3/16in (5mm) wide. Now it's time to start adding detail to the pot and to cut the lid finial. 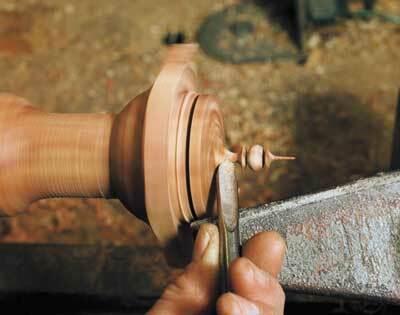 Staying with the spindle gouge, turn the finial down to about 5/16in (8mm) in diameter, then gently turn the top end of the finial down to a fine stem for a distance of 1/2in (13mm). Form a small bead using a BCWA, 5/16in (8mm) fluted beading tool. Start the cut at the top of the bead then, as the tool enters the wood, gradually bring the handle up, lowering the cutting edge to form the bead. If you wish to form a smaller bead, reduce the width by moving the handle in an arc from left to right as the bead nears completion. If you are the sort who enjoys an adrenaline rush, you can always use the skew chisel and roll the bead, but beware of the square edges. Finally, blend the face of the lid into the edge of the bead so that you create a concave surface between the two. Be very aware of the position of your left hand at this stage as you will be working very close to the square edge. Access to this area is severely restricted so you may prefer to use a narrow, round-ended scraper. Sand and polish the lid, being careful not to allow any build-up of heat on the surface while you are sanding the end grain, as this will cause heat shakes to appear on the surface of the work. Part off the lid and put aside for finishing later. You should now be left with a small step protruding from the base for about 3/16in (5mm), depending on how deeply concave you turned the square edge. Position the tool rest square across the top of the bowl and turn away the step, using the spindle gouge, to leave a small witness about 1/32in (1mm) proud of the surface. This will be used later as a guide for fitting the lid. Rough hollow the bowl of the pot until you are about 1/4in (6mm) from the small witness of the step left earlier. You may prefer to use the scraping method to hollow out the middle until you gain experience of back hollowing, as your left hand will otherwise be perilously close to the spinning corners. The next step is to cut the recess for the lid with a 1/2in (13mm) square scraper. This should be turned until the face of the lid is flush with the top of the bowl. Any mismatch and the finished piece will lose some of its appeal. If you plan to reverse-turn the underside of the lid later, remember to leave the lid slightly proud of the surface to allow for this. Once the fit of the lid is correct you can finish the inside of the bowl. To remove the bulk of the remaining wood, use a 3/8in (10mm) spindle gouge in a scraping action until the width of the lid recess is about 1/8in (3mm) wide. Further refine the finish using a 1/2in (13mm) round-nosed scraper to shear scrape the inside. Starting at the top of the square edge, turn away the underside of the square flange, taking small cuts at a time. Try to turn this section in one continuous movement towards the stem of the pot, until you are clear of the square edge by at least 3/8in (10mm). It is important to use the tip of the tool to turn the first section until you reach a true diameter, at which point the handle can be lowered and the gouge can be used on its side to produce a shearing cut. If you try to use the side of the gouge against the square edge it can easily catch and shatter the work. The edges of the square flange will be unclear when the pot is spinning. To help define the edges, place a sheet of contrasting coloured card behind the pot. Continue turning away the underside until the edge of the square is the required thickness. When the square flange is finished, rough turn away some of the wood from the stem to allow the rest of the underside to be completed. At this stage, leave the stem of the pot with a diameter of around 5/8in (16mm) to support the top. Check the thickness in the base of the bowl with callipers periodically to make sure you have an even section all round. 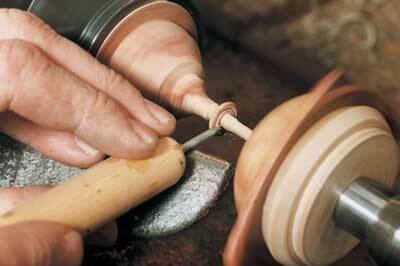 Using the long point of the skew chisel, turn a small V at the base of the bowl. 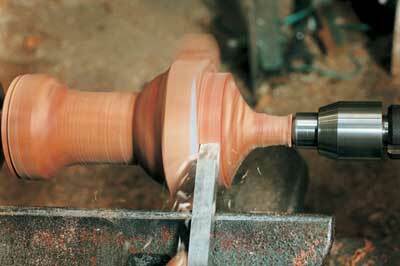 This will give a definite end to the bowl, providing a visual separation from the stem when the pot is finished. Before proceeding further, sand the bowl and square of the pot. To sand the surface around the square edge, it will help if you use a good quality, flexible abrasive such as one of the cloth-backed varieties. Take care not to leave any loose threads attached as they might catch on the work. Roll a piece into a tube, hold it 1/2in (13mm) away from the end between the thumb and forefinger of one hand, and support it with the other to provide a stable grip. By holding it in this way and applying gentle pressure, you will be able to sand the edge without rounding over the corners. Your fingers will also be kept a safe distance from the spinning corners. If just one hand is used to hold the abrasive, or too much pressure is exerted, you can easily slip into the wood, damaging both the pot and your fingers. 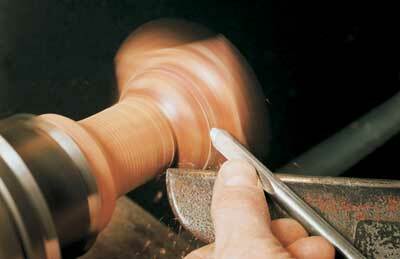 Stop the lathe after using each grade of abrasive, as there may be a few scratched areas left. These can be sanded out by hand before moving on. With the face of the square finished, the flat edges can be sanded. 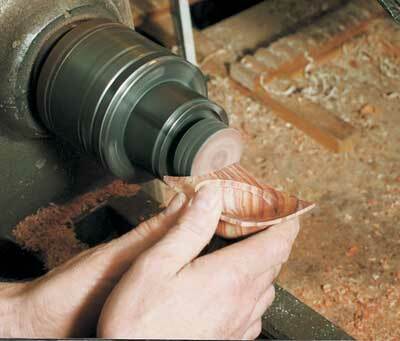 To do this I prefer to remove the pot from the lathe and use a 2in (51mm) sanding disc held in the chuck jaws. Finally, polish and wax the bowl before moving on. Use a soft paper cloth for polishing: if this does catch on the corners it will simply tear the paper instead of damaging the pot or your fingers. On no account should the paper or polishing cloth be wrapped around your fingers or disaster is sure to happen. If the cloth should catch on the corner of the spinning work, you will not be able to pull your hand away. If you use wire wool to flatten the polish or apply the wax, be sure to stop the lathe first to avoid catching the corners. If you intend to reverse-turn the base of the pot, start at the base and work towards the bowl to turn the stem details. This will ensure that the stem remains strong enough to support the turning at the base until after the foot has been completed. If you are not going to reverse turn then continue as described. As the top of the pot is fairly large in relation to the diameter of the stem, you may have to support the bowl, especially if the stem is to be fairly slender. 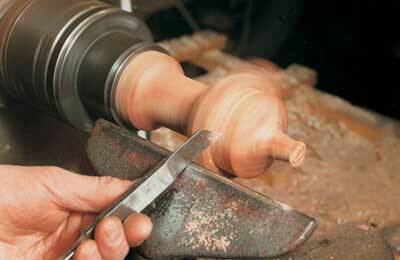 This is done by fitting a turned wooden plug into one of the adapter ends of the hollow centre. Rough turn the stem down to a diameter of around 1/2in (13mm) along its length, leaving enough wood to create the foot later. Using the tip of the 3/8in (10mm) spindle gouge, turn the top end of the stem, starting at the left side of the V cut made earlier, to produce a small, concave radius leading into the stem. Leave the diameter slightly larger than the desired finished thickness of the stem. Continue the cut for a distance of about 5/8in (16mm), leaving plenty of room to turn a small captive ring if required. Using a conventional 1/8in (3mm) parting tool, turn down a square shoulder to just above the stem diameter. Move the tool to the left and turn a groove to the same diameter to leave a flange on the stem about 3/32in (2mm) wide. 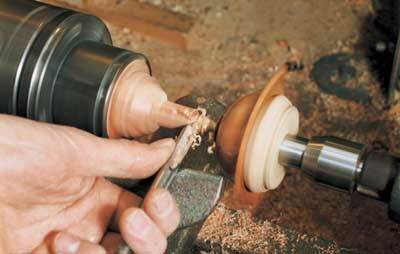 Next, turn away some of the waste wood from the lower end of the stem to provide access while turning the ring. Turn a small bead on the top of the flange either by using the radius in the end of a 3/32in (2mm) fluted parting tool, or by using a small, fluted beading tool and moving the handle from side to side to reduce the width down to the required size. Undercut the ring on both sides, leaving just a small amount of wood attached, using two small hook tools in a scraping fashion. 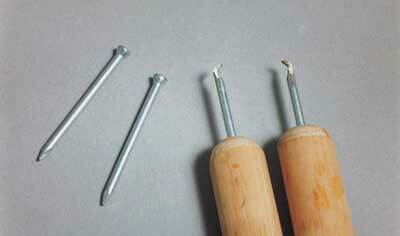 My hook tools are miniature scrapers made from masonry nails. They have small left- and right-handed hooks ground on the ends. 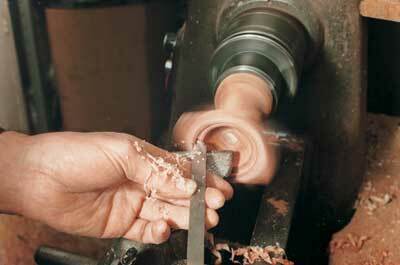 For captive rings with a larger section, the corners of a fluted beading tool may be used to undercut the ring. 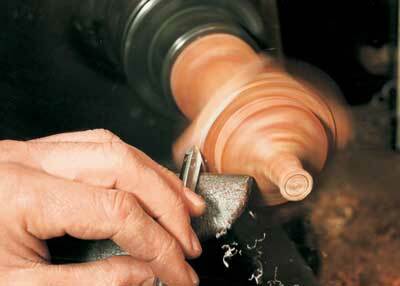 After the ring is undercut, sand and polish it before separating the ring from the stem. 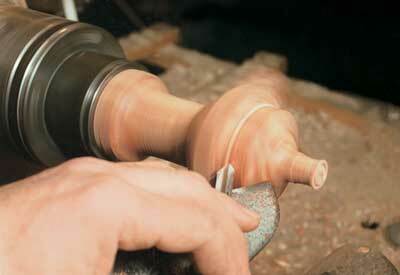 Using the spindle gouge, turn the upper end of the stem to the required diameter, and blend in the remaining section left from where the ring was cut. To finish, turn the lower end of the stem to blend in. 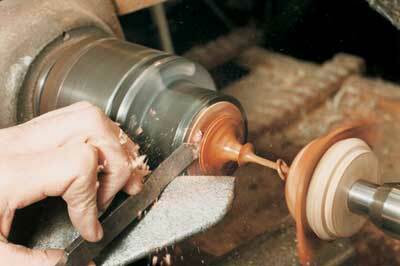 Turn away the waste wood, close to the jaws of the chuck, to the finished diameter of the base. 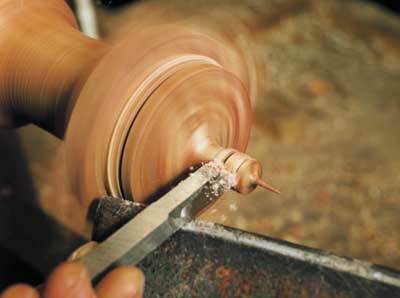 Next, establish where the pot will be parted off by using the fluted parting tool to mark the base of the work. Turn in the detail of the foot before using the skew chisel to cut a small V between the foot and the stem. This should be made to look similar to the one underneath the bowl. Finally, sand and polish the pedestal and stem before parting off. Remember that wire wool should not be used on the stem while it is rotating as it is likely to wrap around and snap the work. When parting off, it is safer to select a lower speed than you have been turning at or the work could break free unexpectedly. Stop the lathe before cutting the whole way through and finish off with a fine-toothed hacksaw blade. Sand the undersides of the base and the lid using the 2in (51mm) disc sander held in the lathe as before. Alternatively, to give a professional touch, the undersides can be reverse-turned. "The pots can be as intricate or as simple as you wish"